Congratulations! You’re a few simple steps away from owning a great modular synth power supply that will serve you for years and that you’ll have the satisfaction of having built yourself. 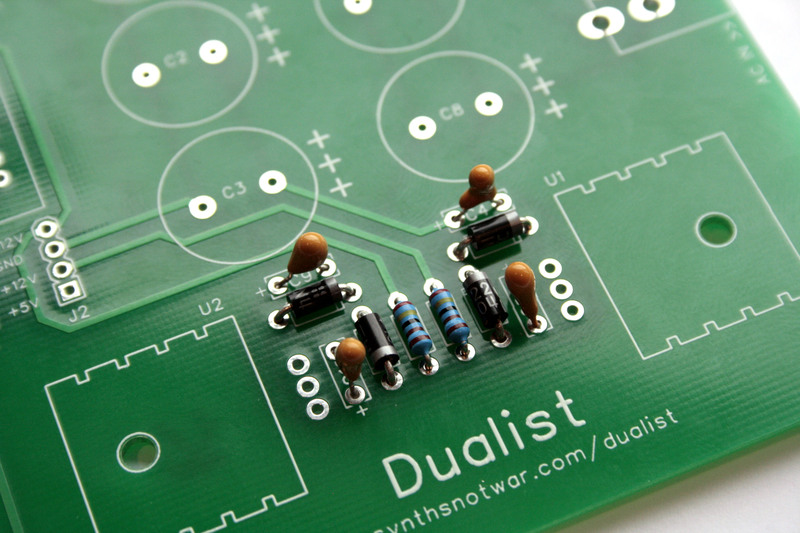 Enjoy building your Dualist power supply, we hope you make great music with it! Putting our Dualist power supply together is pretty straightforward; the parts count is low, the parts are easy to identify and all of the parts go on one side of the PCB. 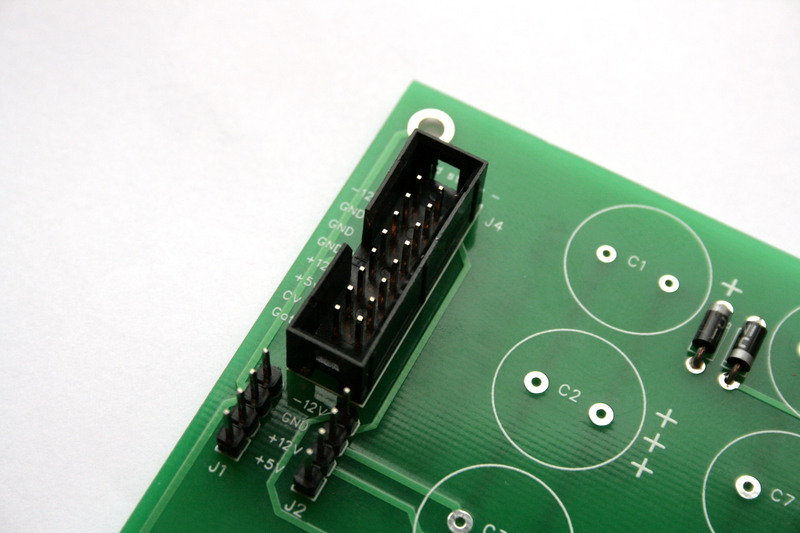 We’ll be working entirely on the side of the PCB that has the component markings and references printed on it. Locate the positions for R1 and R2 and solder both of the resistors into place. It doesn’t matter which way round they go as long as they’re in the right location. You can tidy the wires now with a pair of cutters or do them later (I tend to do mine as I go along as it makes the PCB easier to photograph). There are six of these 1N4004 diodes located around the PCB. Diodes have to be inserted the correct way round – so make sure that the white bar at one end of the diode matches the bar on the printed symbol. Set each diode into place, check it, then flip the board over and solder it into place. Repeat until all of the diodes are soldered. These capacitors are polarised, which means there’s a right way to orient them on the board. The longer leg of the capacitor goes into the hole marked “+” on the PCB; it can sometimes be a little unclear as to which is the longer leg on these components, so you can also look for the “+” marking n the body of the capacitor. Locate the positions for these capacitors on the PCB, check that they’re oriented correctly and then solder them into place. You’ll find the locations for these in the middle of the left edge of the PCB. 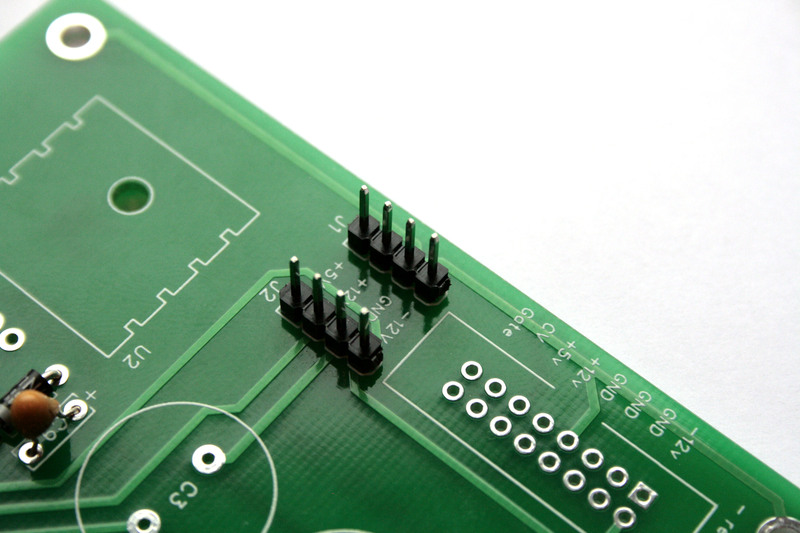 Working with one at a time, locate the pin header in the holes, flip the PCB over and solder into place. You might find it useful to just solder one pin, then check that the header is straight, making any adjustments before soldering the remaining 3 pins. This Eurorack power header has to be correctly oriented in order to function properly and not damage your modules, so take great care to ensure that the gap in the header shroud matches the gap in the printed outline on the PCB silkscreen. Position the header, then flip the board over and solder one pin into place. Before you continue to solder the remaining pins, flip back over and check once more that the header is correctly oriented. If you are happy that everything is laid out correctly, continue to solder all of the remaining pins. The voltage regulators, although they look identical to each other, perform different functions and have different pin assignments so it’s essential that they are correctly placed on the PCB. We strongly advise that you work with one regulator at a time, and check the print on the component to ensure that you’re working with the correct one (U1 is LM7812, U2 is LM7912). It’s important that each regulator goes in the right way round, but if you take a close look at the photo you’ll see there’s only one way it will actually fit. First thing you’ll need to do, though, is make it bend at the knees. Position a heatsink over the printed outline on the PCB, then locate the regulator pins in their holes; you should now be able to pass an M3 machine screw through both the regulator and the heatsink and secure them into place with an M3 locknut on the backl of the PCB. Repeat the process for the other regulator. These components offer options for how you get power into your Dualist. 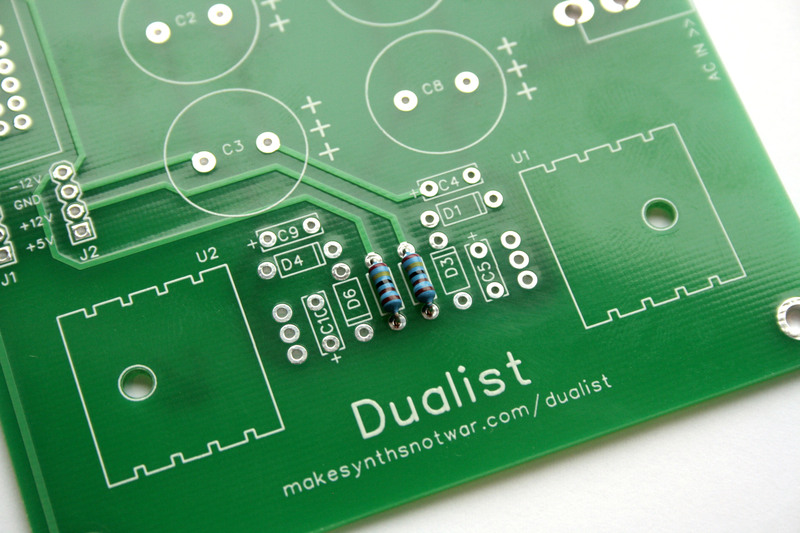 We recommend that you add both so that your Dualist is ready for any future changes in your modular setup. Both parts should be oriented with the open side facing the edge of the PCB. Locate the pins in their holes and then solder the parts into place. Important note: on the initial release batch of the PCB, one of the holes for JK1 is tight; you’ll need to either pinch the pin with pliers or file some of it away to reduce its width slightly in order for it to fit. 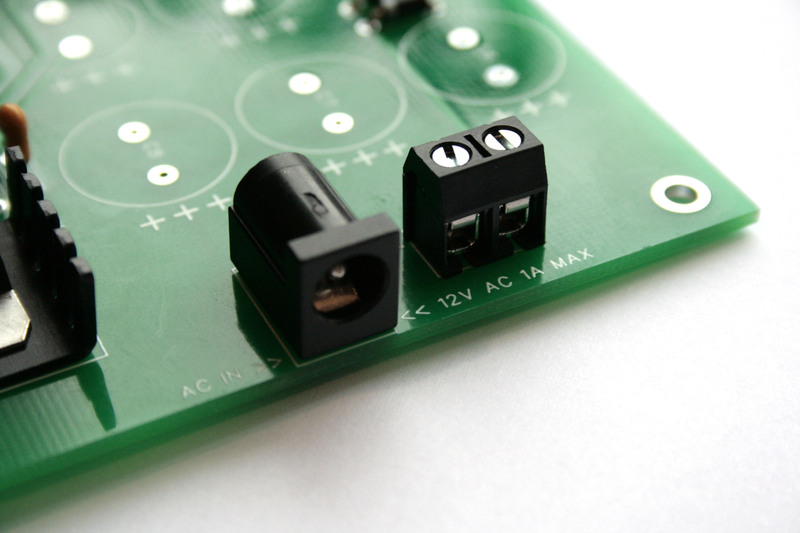 This does not affect the function of the component at all and this detail will be rectified in the next batch of PCBs. These large 4700uF capacitors smooth the regulated power. 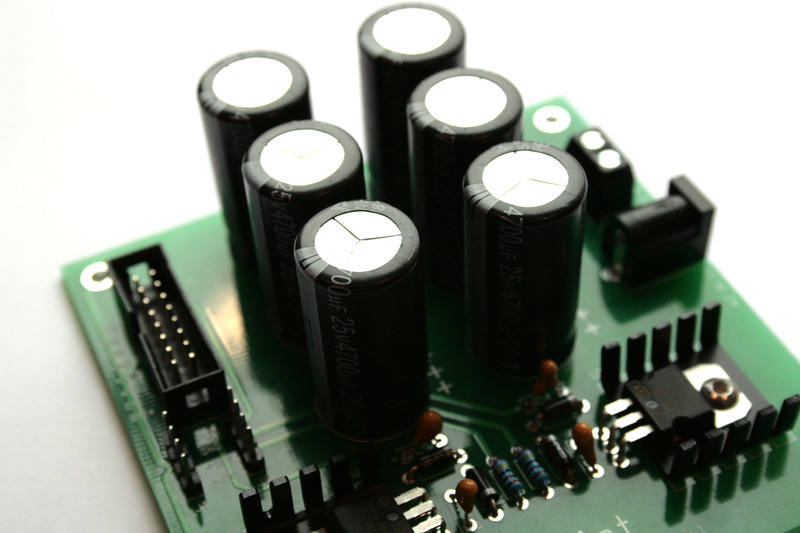 Electrolytic capacitors are polarised – they have a positive and a negative connection and these have to be the right way round. If you look at the locations for these capacitors on the PCB you’ll see that one hole has a “+” or “+++” symbol next to it. This shows that the positive pole of the capacitor should connect here – the other hole is, therefore the negative. So, put the long leg of the component into the hole marked “+” – this should mean that the white stripes are all on the side that faces your 16-pin box header J4. Push the capacitors down snug to the board and solder them into place. That’s it, your Dualist is ready for testing and use. Before we connect Dualist to a power supply, we’ll make a quick test for short-circuits. You’ll need your multi-meter for this step. Work with the pin header J1. Using your meter, ensure that there is NO continuity between the four pins. Next, check the 16-pin IDC header J4 and ensure that there is NO continuity between any two pairs of pins. If your Dualist passes this test, it’s safe to connect it to your power supply and continue with the next set of tests. If it fails this test, take a good look over the back of your PCB for shorts between soldered connections. Rectify and try again. Dualist requires a 12V AC-AC supply with a 2.5mm barrel socket (we chose the 2.5mm component as we found that in this application they seem to “latch” more securely than equivalent 2.1mm connectors). We’ve found some suitable power supplies here (1A) and here (2A, which we recommend), but both are supplied with 2.1mm connectors; if you bought a Dualist kit, you’ll have received a 2.5mm replacement plug as part of the kit, however if you need to obtain one of these they’re available from one of our favourite suppliers. 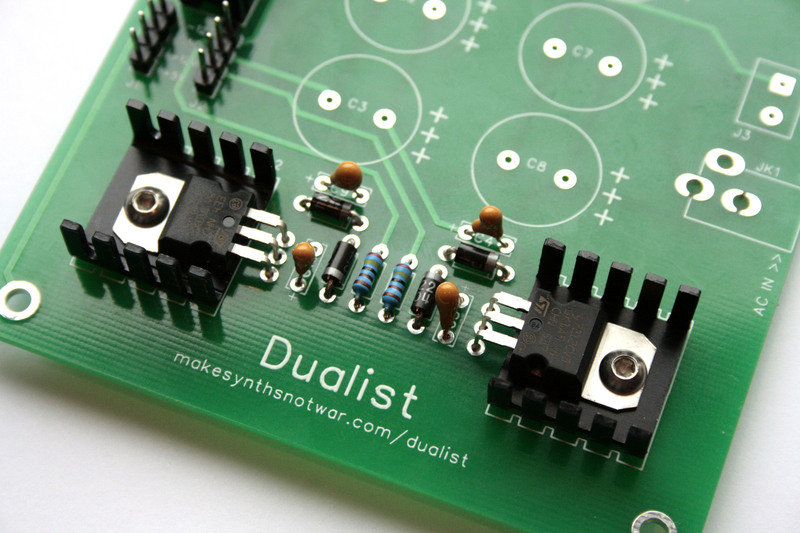 Important note: Dualist requires a 12V AC power supply; you can’t use a DC power supply with this module or with the Dualist PSU. You must not try to power the Dualist PSU directly from mains voltage! Connect your 12V AC supply to Dualist via J3 or JK1. Work with the 4-pin header J1. Touch your meters BLACK probe to pin 3 (GND). Touch the RED probe to pin 2 (+12V). You should measure approximately 12V here (a small amount of drift is acceptable). Touch the RED probe to pin 4 (-12V). You should measure approximately -12V here (a small amount of drift is acceptable). Skipping these tests, carrying them out improperly or ignoring the results can carry serious risks and consequences for you and your equipment. In proceeding to connect Dualist to your equipment, you are assuming liability for any consequential loss or damage. 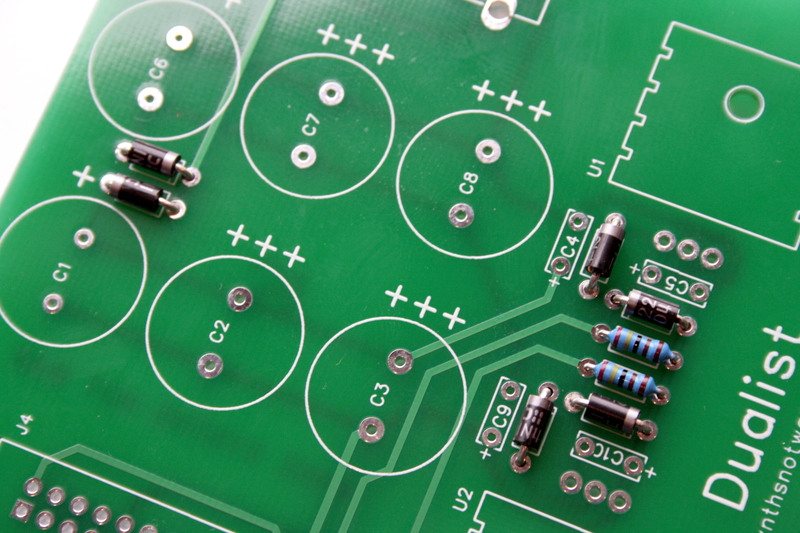 In addition to your PCB you’ll need parts. The full list of parts for the project is given below, with Mouser and BitsBox part numbers to aid you in identifying compatible parts. Although we’ve used all Mouser and BitsBox parts in the example build above, you may be able to obtain cheaper compatible parts by shopping around.